The Winter Dance Party opens tonight in Clear Lake with a new distinction. 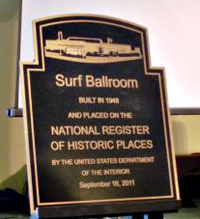 The legendary Surf Ballroom was added last year to the National Register of Historic Places. The Surf, which opened in 1948, is best known for hosting the final performances of Buddy Holly, Richie Valens and J.P. “Big Bopper” Richardson. They died in a plane crash shortly after the original Winter Dance Party in 1959. Jeff Nicholas is president of the Surf Ballroom and owns the cornfield where the three singers died in a plane crash. “We have long felt that the Surf Ballroom truly is a national treasure. Our real impact and influence is on rock and roll. We’re very excited to welcome the world to Clear Lake every February to celebrate,” Nicholas said. The ballroom is part of rock and roll history and is lined with photos of legendary performers who have taken the Surf’s stage, including Buddy Holly, hours before his death. “There are only seven pictures taken of the guys here at the Surf that have surfaced anywhere in the world. So we’re very proud and excited about having people, just during the day and during the week, exploring the early roots of rock and roll,” Nicholas said. The big event for this year’s Winter Dance Party is sold out. It’s a Saturday concert with Pat Boone the Bobbettes and singer Tommy Allsup, who played lead guitar for Buddy Holly’s last performance back in 1959.